Graphene, a sheet of carbon only a single atom thick, was an object of theoretical speculation long before it was actually made. Theory predicts extraordinary properties for graphene, but testing the predictions against experimental results is often challenging. Now researchers using the Advanced Light Source (ALS) at the U.S. Department of Energy‘s Lawrence Berkeley National Laboratory (Berkeley Lab) have taken an important step toward confirming that graphene is every bit as unusual as expected – perhaps even more so. The Dirac point is a unique feature of graphene’s band structure. Unlike the band structure of semiconductors, for example, graphene has no band gap – no gap in energy between the electron-filled valence band and the unoccupied conduction band. 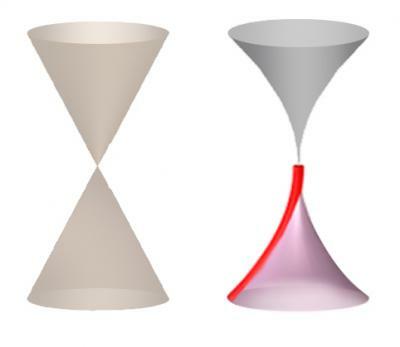 In graphene these bands are represented by two cones (“Dirac cones”) whose points touch, crossing linearly at the Dirac point. When the valence band of graphene is completely filled and the conduction band is completely empty, the graphene can be considered “undoped” or “charge neutral,” and it is here that some of the interesting properties of graphene may be observed. An ARPES experiment neatly measures a slice through the cones by directly plotting the kinetic energy and angle of electrons that fly out of the graphene sample when they are excited by an x-ray beam from the ALS. A spectrum develops as these emitted electrons hit the detector screen, gradually building up a picture of the cone. To understand the significance of the team’s findings, it helps to start with their experimental set-up. Ideally, measurements of undoped graphene would be done with a suspended sheet of freestanding graphene. But many experiments can’t be done unless the target is resting on a solid substrate, which can influence the electronic properties of the layer on the surface and interfere with the experiment. So Siegel and his colleagues decided to investigate a special kind of “quasi-freestanding” graphene, starting with a substrate of silicon carbide. When heated, the silicon is driven out of the silicon carbide and carbon gathers on the surface as a relatively thick layer of graphite (the kind of carbon in pencil lead). But adjacent layers of graphene in the thick graphite sample are rotated with respect to one another, so that each layer in the stack behaves like a single isolated layer. “In solid-state physics one of the most fundamental questions one can ask about a material is the nature of its charge carriers,” Siegel says. “For ordinary metals, the answer can be described by the most powerful theory of solids, known as Landau’s Fermi-liquid theory,” after the Soviet physicist Lev Landau and the Italian and naturalized-American physicist Enrico Fermi. While individual electrons carry charge – the electric current in a copper wire, for example – even in a metal they can’t fully be understood as simple, independent particles. Because they are constantly interacting with other particles, the effects of the interactions have to be included; electrons and interactions together can be thought of as “quasiparticles,” which behave much like free electrons but with different masses and velocities. These differences are derived through the mathematical process called renormalization. Landau’s Fermi liquid is made up of quasiparticles. Besides describing features of electrons plus interactions, Fermi liquids have a number of other characteristic properties, and in most materials the theory takes generally the same form. 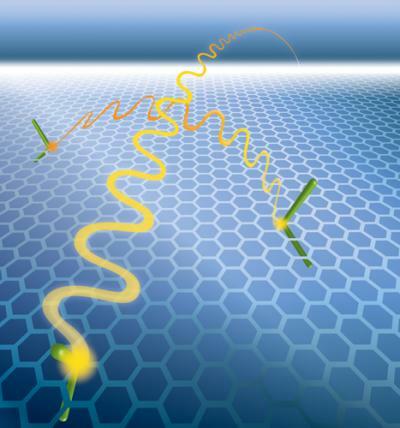 It holds that charge carriers are “dressed” by many-body interactions, which also serve to screen electrons and prevent or reduce their longer-distance interactions.